A month on and we still have 11 chickens so all three mothers have done well. Being an old hand at parenting Granny Chook has abandoned her brood already so the oldest teenagers now have to fend for themselves. They’re all proving to be skittish, but the rather daffy, and the only brownish-coloured one in the trio is the silliest, and barely has the courage to join the others at breakfast time, or any other time when food is scattered their way. The younger teenage trio are a bit braver, but they are also having to learn to be independent of mum, who has recently started to take less notice of them, leaving them to fend for themselves for much of the day. They seem to be taking growing up in their stride though, and unlike their older cousins certainly aren’t proving backwards in coming forwards when wheat, bread or veggie scraps are on offer. 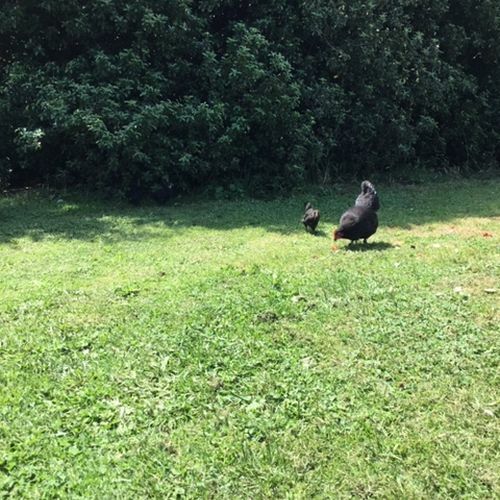 As for the ring-in, the pretty black and speckled grey chook with a very pert tail, who was abandoned at a nearby rental property and is still very flighty, well she’s managed to keep five out of the six chicks that hatched, but my goodness has she proved to be an over-protective mum. She’s improving slowly, but for the first few weeks she kept them so close and hidden, we doubted any would survive. Death from starvation was the likely outcome as we had endless trouble on a daily basis finding her little family among the long grass and shrubs, and she was – and remains – so quiet we could never hear them cheeping, or her clucking, such was her apparent terror of anything or anyone considered a threat. Thankfully in the last week she’s relaxed her attitude, and now joins the early morning breakfast scrum, and appears to be a bit more sociable throughout the day. Just what psychological damage she might have imparted to her chicks as a result of her bizarre isolationist stand remains to be seen though! Whether any of these chicks are males, and therefore unlikely to survive long-term, is still unclear, but hopefully their gender will soon be identifiable and most will prove female and thus able to enjoy long and productive egg-laying lives – if not with us then with some of our friends who’ve already put up their hands to give some chickens a home. Summer is berry nice . . ! Now there are six . . . or seven . . .